Review thousands of term life insurance policies from over 135 A-rated insurance carriers instantly. You can get an instant online quote by clicking the "Get Quote Now" link above, or spend 12 minutes with our licensed agents by calling (877) 472-4279. They can help you find the best policy for your needs. Call our licensed agents to do some pre-underwriting to make sure you can qualify for specific rates based on your health, height/weight, driving record & family history. No need to submit an application without knowing there is a good chance it will get approved. If health issues are a concern, we will have you complete a short form "preliminary inquiry", that will be sent to multiple carriers to indentify which carriers want your business, at the best price. Apply for coverage with your chosen insurance company. We will set up your paramedical exam to be done at your home or work.. The insurance company may request records from one of your doctors. The insurance company responds with their offer. We work with you to negotiate the best rate. You have a no-risk guarantee since you have up to 30 days (depending on your state) to return the policy and receive a full refund. Your family now has peace of mind. A whole life insurance policy provides a financial return on a monetary investment upon the policy’s maturity or the person’s death. An individual is required to pay a fixed premium each month to cover the policy’s cost. This amount is then payable to a beneficiary at that person’s death. The policyholder can borrow against the policy’s cash value. If the amount borrowed is not repaid, it is subtracted from the cash settlement when the policy matures or is surrendered. Alternatively, if the owner of the policy needs cash, he or she can surrender the policy for its current cash value. Whole life insurance policies are purchased for the duration of one’s life. The premiums do not change or increase while the policy is in effect. These policies are more effective for estate planning than for investment. 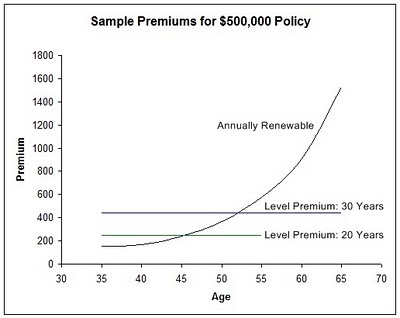 Rates for Annually Renewable term policies increase each year with mortality. 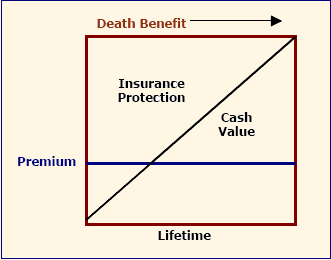 With "Level Term" policies, both the death benefit and the premium are guaranteed to remain level for the entire term. The price can't increase. The coverage can't decrease. You can cancel any time without a penalty, but the Term Life Insurance company can't cancel your policy as long as you pay the premium. When the term ends, you can choose to either stop or continue it at rates that increase until you reach the age of usually 95 or 100. Term policies cost much less than whole life policies. In addition, they are often economically more feasible for the ordinary person. Most of the time, people are able to invest more effectively by purchasing a term policy, and placing the additional money that would be spent on a whole life policy in an investment account. For those that are not familiar, the return of premium rider allows the policy holder to get a full refund of all the premiums paid at the end of the contract. 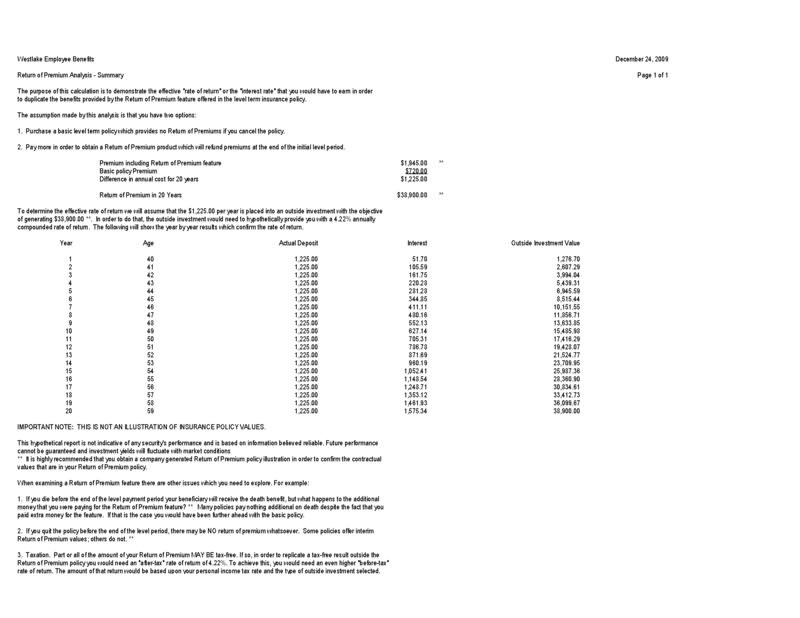 To illustrate the cost difference between purchasing regular term insurance vs. one with ROP ride, here are some quotes that I ran. In our scenario, I am using a 40 year old male, assuming he is not in excellent health, but is considered a Standard Non-Smoker. We are going to quote a 20 year term life policy with a $500,000 face value. Without the ROP, the annual premium will cost approximately, $720 per year for a total of $14,400 premiums paid over the 20 year period. Buying the ROP policy, the premium jumps to $1,945 per year, for a total outlay of $39,900, but if you don't die, you get all the premium back at the end of 20 years. If we compare 30 year plans on the same age 40 individual, we find Hartford Life with the lowest cost 30 year term at $1,195. Cincinnati Life's 30 year term with ROP would cost $2,150 per year. If you invest the $955 annual difference in an outside investment, you would have to get a 4.82% after tax return to save up the same $64,500 that would be given back to you if you are living after 30 years. Not a bad supplemental retirement sum returned tax free for a 40 year old who believes they will live past age 70. In closing, Return of Premium plans are worth evaluating, especially if you do not have risky hobbies, and have family longevity. Of course, every person's situation is different, so let us provide a comparison specifically designed for you.